Scientists at Chalmers have succeeded in creating light from vacuum -- observing an effect first predicted over 40 years ago. In an innovative experiment, the scientists have managed to capture some of the photons that are constantly appearing and disappearing in the vacuum. The results have been published in the journal Nature. Chalmers scientist, Christopher Wilson and his co-workers have succeeded in getting photons to leave their virtual state and become real photons, i.e. measurable light. The physicist Moore predicted way back in 1970 that this should happen if the virtual photons are allowed to bounce off a mirror that is moving at a speed that is almost as high as the speed of light. 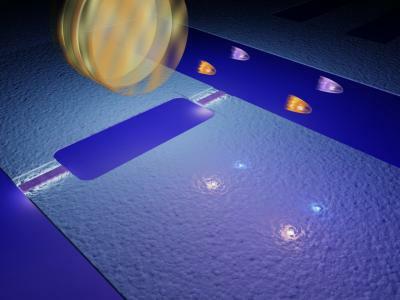 The phenomenon, known as the dynamical Casimir effect, has now been observed for the first time in a brilliant experiment conducted by the Chalmers scientists. "Since it's not possible to get a mirror to move fast enough, we've developed another method for achieving the same effect," explains Per Delsing, Professor of Experimental Physics at Chalmers. "Instead of varying the physical distance to a mirror, we've varied the electrical distance to an electrical short circuit that acts as a mirror for microwaves." The "mirror" consists of a quantum electronic component referred to as a SQUID (Superconducting quantum interference device), which is extremely sensitive to magnetic fields. By changing the direction of the magnetic field several billions of times a second the scientists were able to make the "mirror" vibrate at a speed of up to 25 percent of the speed of light. "The result was that photons appeared in pairs from the vacuum, which we were able to measure in the form of microwave radiation," says Per Delsing. "We were also able to establish that the radiation had precisely the same properties that quantum theory says it should have when photons appear in pairs in this way." What happens during the experiment is that the "mirror" transfers some of its kinetic energy to virtual photons, which helps them to materialise. According to quantum mechanics, there are many different types of virtual particles in vacuum, as mentioned earlier. Göran Johansson, Associate Professor of Theoretical Physics, explains that the reason why photons appear in the experiment is that they lack mass. "Relatively little energy is therefore required in order to excite them out of their virtual state. In principle, one could also create other particles from vacuum, such as electrons or protons, but that would require a lot more energy." The scientists find the photons that appear in pairs in the experiment interesting to study in closer detail. They can perhaps be of use in the research field of quantum information, which includes the development of quantum computers. However, the main value of the experiment is that it increases our understanding of basic physical concepts, such as vacuum fluctuations -- the constant appearance and disappearance of virtual particles in vacuum. It is believed that vacuum fluctuations may have a connection with "dark energy" which drives the accelerated expansion of the universe. The discovery of this acceleration was recognised this year with the awarding of the Nobel Prize in Physics.